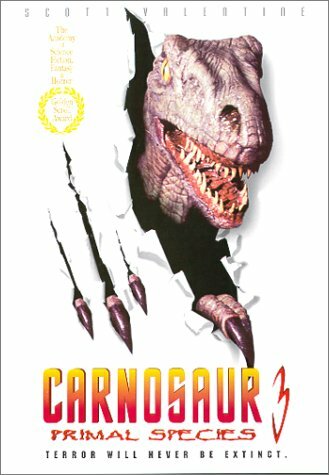 After the delightful abominations that were Carnosaur 1 & 2, Rodger Corman rolls out yet another dinosaur flick within the same year of the 1994 sequel, entitled Carnosaur 3. 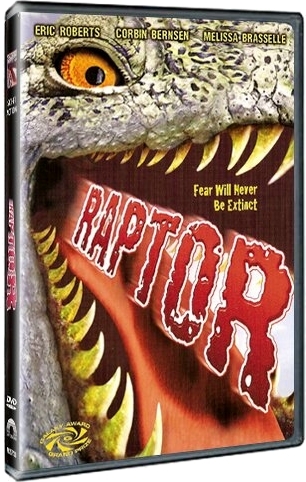 And yes, it even follows the same group of dinosaurs that were human-bred into the world in the first movie. I’m not sure how these dinosaurs kept surviving. 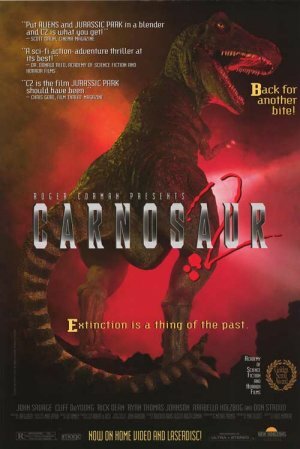 I mean, after the nuclear blast that capped off movie #2 these dinosaurs seem to be more radiation-blast proof than Indiana Jones in that 2009 movie. And yet they’re still prone to die when hit by things like bullets and smaller explosives, again like Indiana Jones in that 2009 movie. A small group of Caucasian terrorists (I have to make a distinction in light of the Taliban, who don’t make an appearance in this movie) steal some sorely guarded trucks of Uranium protected via the U.S. Military. (Nice job, Military.) The Uranium was en route to somewhere else, (does it really matter where at this point? *) which made it an easy target for terrorists dressed in black ninja suits in broad daylight. I guess the terrorists were so good that they don’t need the cover of night to camoflauge in their black suits. I mean, if they can take on the U.S. Military and win then they MUST be good. There are some movies that defy all thought and predictions. Films that go beyond the boundaries set for them by their contemporaries. Films that literally boldly go where no respectable person has gone before. (Mainly because respectable people know better.) These are films that are so bad they’re good. You laugh at they’re vain attempts to make you care, the silly ideas that are meant to scare you, and performances that no one, not even the actors and director, seemed to know what they were going for.These are the films that find themselves in our Guilty Pleasures Pile, and though many on this film blog have already thrown stuff into the pile, I’m going to make my first contribution in a while to the stash with a little mockbuster film Roger Corman executive produced en lure of Jurassic Park called Carnosaur. In fact, it’s fun to see how these two franchises kept butting into each other’s territory. You know you respect the Drive-In. 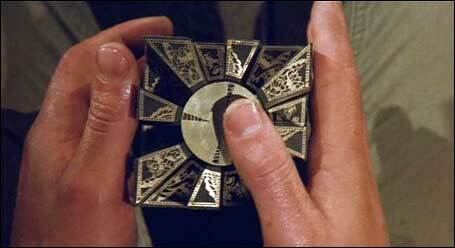 I don’t know if I could call myself a “freaky film fan” if it weren’t for cult films. 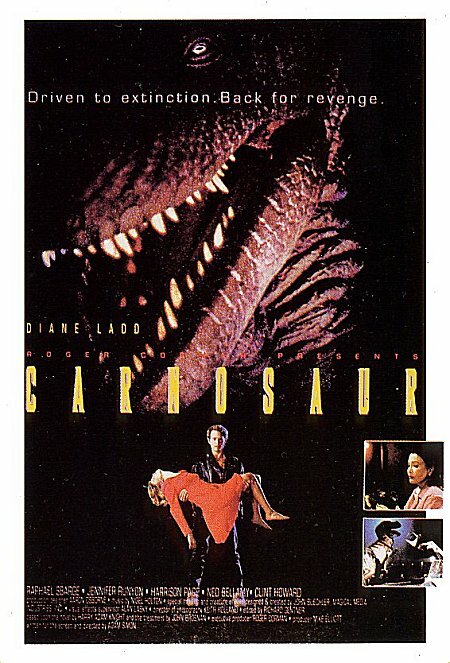 The campy, terrific fun of those movies are a great source of film in-jokes, good ideas gone bad, and some insight into the young culture starving for their style of entertainment before the reform of Hollywood in the 1960’s.